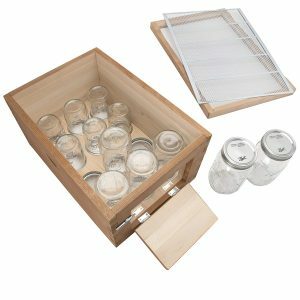 The SummerHawk Ranch 38540 Jar Super provides a modern and innovative way to add to your beekeeping experience. There are plenty of reasons that drive so many across the globe to engage in beekeeping. For beginners, beekeeping, also referred to as apiculture, refers to the practice of rearing bees for honey and other honeybee products and services. Top on the list of products derived from beekeeping is the honey. Wax is also a product manufactured by bees, not to mention propolis, pollen, and royal jelly. All these products are used widely across most industries today. Bees have been man’s friend for centuries and honey harvesting is not something that came into being recently. Pollination also makes it possible for trees, crops, fruits, and gardens to bloom and produce. The honey bee and bumble bee are both used for pollination services. Wild bees thrived and continue to thrive in the absence of man’s intervention. They manufacture their own honey and inhabit natural environs such as rock crevices, tree trunks, underground holes, and many others. It is however difficult for man to access these areas and hence the need for the beehive. There are many beehive designs out there and in this article we’ll take a look at the SummerHawk Ranch 38540 Jar Super. It is a relatively recent invention that makes beekeeping fun and most fulfilling. It is ideally more advanced when compared to the traditional beehive super. The SummerHawk Ranch 38540 Jar Super features a modern design that eliminates what would be expected of a traditional beehive super. It comes with an innovative jar super that directs the honey generated into mason jars. This means you no longer have to smoke the hive, harvest honey and then extract it from supers. This is a two way benefit: the beekeeper now has little work when it comes to honey harvesting and the bee colony is left uninterrupted. The unit has a quick-check window on its exterior which helps monitor progress without disturbing the bees. You are no longer required to rip apart the hive or pump in some smoke whenever you need to inspect it. Indeed, this sophisticated hive design makes it possible for the beekeeper to engage in routine checks without opening the hive. This super works well as as addition to the SummerHawk Ranch 38533 Honey Mason Jar Beehive. It is made of Canadian Hemlock wood. This is sourced from sustainable wood. It comes with 1 deep jar super which has a unique quick-check window used for viewing progress. Fitted a total of 6 1-Quart and 6 1-Pint glass jars. These are complete and have lids. Also included are 2 ventilated screens, a stainless steel queen excluder, and a one ventilated inner cover. The hive wood components have finger-joint construction which makes it easy to assemble the hive. This unit weighs 27.5 pounds and has dimensions of 22.4 by 15.6 by 13.8 inches or 25 x 35 x 27.9 cm. Made of sustainable Canadian wood. It is sturdy and longer lasting. This is a sophisticated design that guarantees least disturbance to the bees during honey harvesting and hive inspection. Quick-view window makes it easy to monitor the hive. Covered by a comprehensive warranty. Easy to assemble. The finger-joint construction makes it easy to assemble and disassemble the hive. It has an inner cover, queen excluder, and ventilation screens. Requires the least effort from the beekeeper. Reduces chances of injuring or killing bees during inspection and honey harvesting. Higher productivity from the bees since they are never disturbed. Best suited for all skill levels, more so, the hobbyist. Quite a bit more expensive than traditional hive supers. Eliminates the hurdles you go through when using traditional hive: smoking the hive, brushing bees, opening frames, and many others. These activities can be quite challenging and exciting, and also furthers your beekeeping knowledge. The SummerHawk Ranch 38540 Jar Super is an ingenious design that has delighted many. It is a hive that offers less stress to the bees and eliminates the hard work involved in traditional hives. You can describe it as a smart design hive given all its advantages. 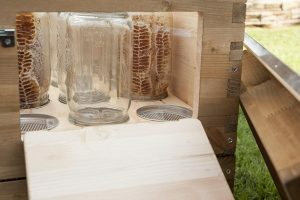 Two of the things that stand out from this kind of hive are the quick-view window and its use of Mason jar supers. This means there is no longer the need to tear apart the hive and honey frames when you need to inspect the hive or harvest honey. It also means hive inspection is now quicker and free of stress. Honey flows directly into the mason jars and hence you do not have to invest in honey extracting equipment. However, you should procure a honey storage tank. The innovative design of the SummerHawk Ranch 38540 Jar Super with its honey harvesting system automatically reduces the costs involved in beekeeping. First off, you are not required to invest in equipment such as bee brush, honey extractor, hive tool, and uncapping knife. Secondly, it takes the least time to inspect the hive. Honey harvesting is also faster and hence it is a time saver. Finally, bees are more productive in this kind of system since they are least disturbed. It also reduces substantially the number of bees you lose during hive inspection and honey harvesting. The SummerHawk Ranch 38540 Jar Super stands out when it comes to its efficiency, ease of use, productivity, innovation, and maintenance required. It is a clever design that has taken the beekeeping market by storm. Most buyers especially the hobbyists find it ideal given its ingenious design. This hive has greatly reduced the amount of work undertaken by the beekeeper and has completely eliminated stress on the bee colony. Hive inspection and honey harvesting now takes a matter of minutes to be completed. However, there is a catch. With such a design, the beekeeper has to be extremely cautious when harvesting the honey. The colony reserves should never be exhausted otherwise you might risk losing an entire bee colony. Do you own the SummerHawk Ranch 38540 Jar Super? Leave a comment below and let us know what you think of it.